Mister Miracle #6 (DC Comics, 2018). $3.99. This is by far one of the greatest single-issues of a monthly comic book I’ve read in years. It’s one thing to pick up an issue of an ongoing series from Drawn & Quarterly or Fantagraphics if it only comes out once or twice a year and be thoroughly thrilled and enlightened. It is quite a different phenomenon altogether to pick up an issue of a series you are reading month by month and be totally gobsmacked by what you’re reading. I’d been enjoying this series very much for the first five issues. Number six floored me, and by the end of the issue I was rendered simply giddy by what I was reading. This issue, all by itself, utterly reaffirms my decision to start buying some of my comics on a monthly basis again at my local comic shop rather than just trade-wait. I gave up monthly comics in 2011 when I moved to Chicago and awaited the birth of my first child. There simply wasn’t time anymore to get to the comic shop on a regular basis. I was a trade-waiter, through and through, partially because as a new parent I wasn’t even aware what month it was sometimes, partially because toddlers will rip the covers off of your single-issue comics in the blink of an eye and then keep on moving towards the next thing in your house they seek to destroy. 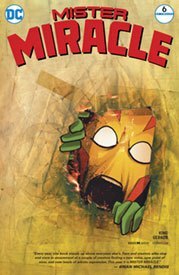 Mister Miracle absolutely benefits from a month by month, chapter by chapter approach. The pacing just wouldn’t work as well if I’d come to this sixth issue in the middle of a collected volume. Case in point, I just couldn’t get into Tom King’s The Omega Men when I read it as a trade paperback collecting all twelve issues. It had some lovely moments, but they quickly ran together into a complete blur as I read it all in a few days while travelling. I suspect I would have appreciated it much, much more if I’d come to it in regular installments over the course of a full year. In our current age of binge-watching, I have learned that there is still something to said for the pleasures of serialization and the prolongment of a narrative via steady installments over time. I’m not even going to tell you anything about what happens in this issue. Let’s just say that the action scenes and the character development are blended together in a unique fashion. You can easily pick this up even if you aren’t reading the whole series. This issue stands on its own beautifully. Hooray for serialized monthly comics!! Double–Hooray for floppy single issues!! Triple-Hooray for King and Gerads!!! 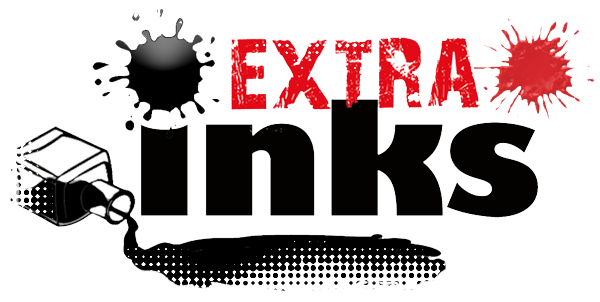 Support your local comic shop, won’t you… on a monthly basis.